During the annual sessions of the 13th National People's Congress (NPC) and the 13th National Committee of the Chinese People's Political Consultative Conference (CPPCC) in Beijing, President Xi Jinping, also General Secretary of the Communist Party of China (CPC) Central Committee and Chairman of the Central Military Commission, joined some panel discussions with NPC deputies and CPPCC National Committee members, listened to opinions and suggestions and delivered important speeches. His remarks, while instructing the work for 2019, further elaborated Xi Jinping Thought on Socialism with Chinese Characteristics for a New Era. On March 4, Xi called on writers, artists and theorists to strengthen cultural confidence, serve the people with fine works and guide the public with high moral standards. He made the remarks at a joint panel discussion of political advisors from the culture, art and social sciences sectors attending the Second Session of the 13th CPPCC National Committee, the country's top political advisory body. "A country, or a nation, cannot be devoid of soul," Xi said, adding that the mission of professionals in culture, literature, art, philosophy and social sciences is to nurture the roots and soul of the nation. In recent years, these professionals have made notable achievements in improving the quality of their craft. China's cultural industry has grown consistently and become more competitive. In addition, a number of quality books, TV programs and films have recently emerged which reflect people's voices, showcase Chinese wisdom and approach to resolving global issues, and are well received at home and abroad. China's cultural exchange with foreign countries has developed quickly, with China's cultural symbols no longer limited to traditional ones, such as kungfu or the Peking Opera. TV dramas that tell the stories of ordinary Chinese people have also helped global audiences better understand China. Such exchanges promote people-to-people communication and friendship between China and other countries. This year marks the 70th anniversary of the founding of the People's Republic of China. The country has entered a new era. All professionals in culture, literature, art, philosophy and social sciences should keep pace with the times, bear the people-centered principle in mind and produce fine works that reflect reality and are conducive to solving real problems, answering real questions and describing the big transformation China is undergoing. On March 5, Xi stressed efforts to maintain a strategic resolve in enhancing the building of an ecological civilization and to protect the country's beautiful scenery in the northern border areas. Xi made the remarks during a panel discussion with his fellow deputies from Inner Mongolia Autonomous Region on March 5, at the Second Session of the 13th NPC, the highest organ of state power, where he also said the Party's theory on an ecological civilization has been constantly enriched and improved since the 18th CPC National Congress in 2012. Xi urged all localities and departments to earnestly implement the Party's plan and requirements for building an ecological civilization, pushing it to a new level. Ecological civilization construction is also in line with the pursuit of high-quality development which refers to innovative, coordinated, green, open and inclusive development. "In the construction of the Chinese economy in the phase from rapid growth to a stage of high-quality development, pollution control and environmental governance are two major tasks that must be accomplished," Xi said. Economic data in 2018 showed that domestic demand has become the primary engine of growth, while the service industry made a significant contribution to the economy. Local governments must not relax environmental protection efforts due to difficulties in development that come from economic transformation and upgrading. Tackling pollution was one of the three tough battles listed in the 2018 government work report. Over the past year, China has made great progress in curbing pollution, with over 30 million tons of iron and steel capacity phased out and the average density of PM2.5, a major particle pollutant, visibly reduced. This year's government work report said China plans to reduce sulfur dioxide and nitrogen oxide emissions by 3 percent in 2019, while making continuous efforts to reduce the average density of PM2.5 in key locations such as the Beijing-Tianjin-Hebei region, the Yangtze River Delta and the Fenhe-Weihe River Plain. Xi underlined a resolute and effective fight to prevent and control pollution, saying prominent environmental issues the people are strongly concerned about must be properly addressed. Perseverance is now crucial in the fight against poverty since there are only two years left for China to meet its goal of eradicating extreme poverty by 2020. "There should be no retreat until complete victory," said Xi while deliberating with deputies from northwest China's Gansu Province on March 7. Xi emphasized "strong confidence, firm determination, all-around efforts and targeted measures to ensure the achievement of the poverty-elimination goal." "Decisive progress has been made in the country's tough fight against poverty over the past years," Xi said. Since 1949, the CPC has led the Chinese people toward eradicating poverty down a path with Chinese characteristics. 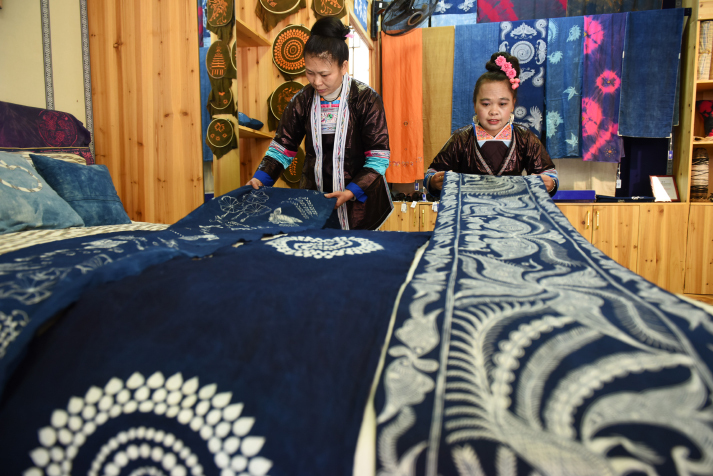 Economic growth has helped lift more than 700 million people out of poverty, making China the first and largest country to meet the UN Millennium Development Goals. All-around poverty alleviation is a key condition for building a moderately prosperous society, one of the Two Centenary Goals. However, along with poverty elimination, Xi warned that the task ahead remains arduous, as those still living in poverty are the worst stricken. He asked Party committees and governments at all levels to shoulder their responsibilities in the critical battle against poverty. During the panel deliberation of the Henan Province delegation on March 8, Xi called for more efforts to implement the rural vitalization strategy with the chief goal of modernizing agriculture and rural areas. Tremendous changes have taken place in China's economic and social development after more than 40 years of reform and opening up. The Chinese economic aggregate is now ranked second in the world. However, the country's economic and social development is not yet balanced, with the manufacturing and service industries growing much faster than the agricultural sector, and urban areas developing much faster than rural areas, leading to a huge urban-rural gap. In China, the rural population still accounts for quite a large proportion of the total population. The modernization of the whole country would be impossible without the modernization of agriculture, rural areas and farmers' lives. 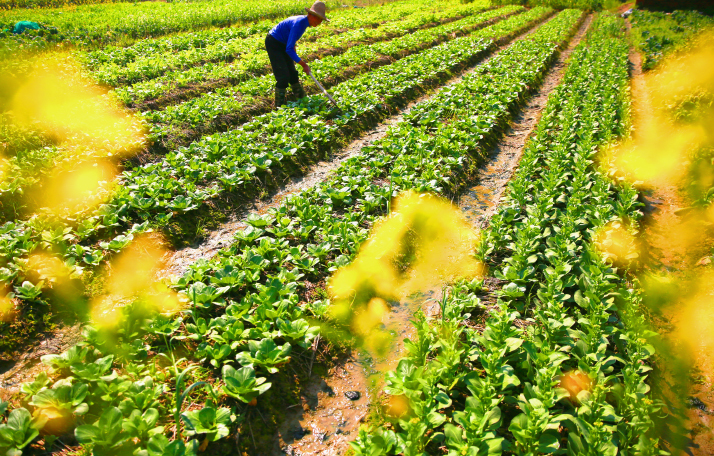 The Chinese Government has vigorously tried to promote the development of rural areas. For over a decade, the No.1 Central Document has focused on issues concerning agriculture, rural areas and farmers. At the 19th CPC National Congress in 2017, the rural vitalization strategy was put forward and has since become an important guide for the CPC Central Committee and the Central Government in the work around agriculture, rural areas and farmers. During the panel deliberation of the Fujian Province delegation on March 10, Xi stressed the need to create a favorable development environment for innovation, entrepreneurship and creativity. He said China should seek momentum from reform and opening up, unleash to the maximum the whole society's power for innovation, entrepreneurship and creativity, and keep improving the country's influence and competitiveness in a world which is undergoing profound changes. He emphasized the creation of favorable conditions for the development of small and medium-sized enterprises and young people, and the establishment of an acceleration mechanism for hi-tech companies. He also urged solid implementation of policies and measures to encourage, guide and support the development of the private sector. Since the 19th CPC National Congress, China has entered a new era where the economy has shifted from high-speed to high-quality growth, with hi-tech, high value-added, emerging and service industries becoming main growth drivers. Innovation, entrepreneurship and creativity hence have become important measures and tasks to advance the rapid development of new growth drivers. 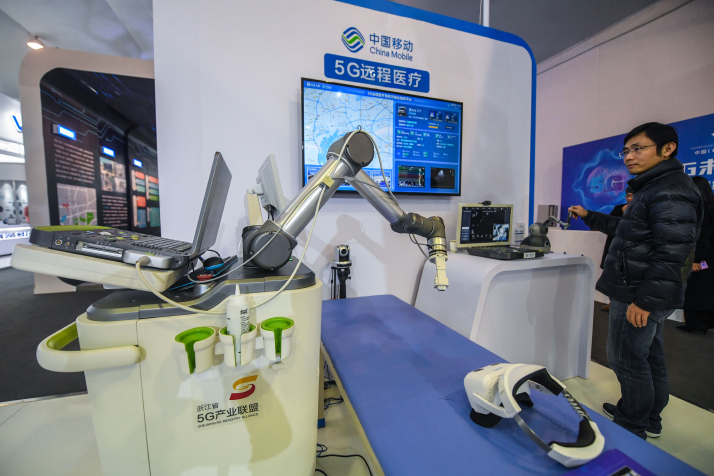 Several years ago, the Chinese Government launched a campaign of mass innovation and entrepreneurship and vowed to change from "Made in China" to "Created in China." Figures from the National Bureau of Statistics showed that in 2018, strategic emerging manufacturing and service industries grew rapidly, with the value-added of the hi-tech manufacturing industry increasing by 11.7 percent. However, for a market with a population of 1.39 billion and a GDP of over 90 trillion yuan ($13.39 trillion), China's innovation, entrepreneurship and creativity are still inadequate to play a decisive role in supporting the country's economic and social development. Therefore creating a favorable environment for them to facilitate their development still remains a priority of the government. 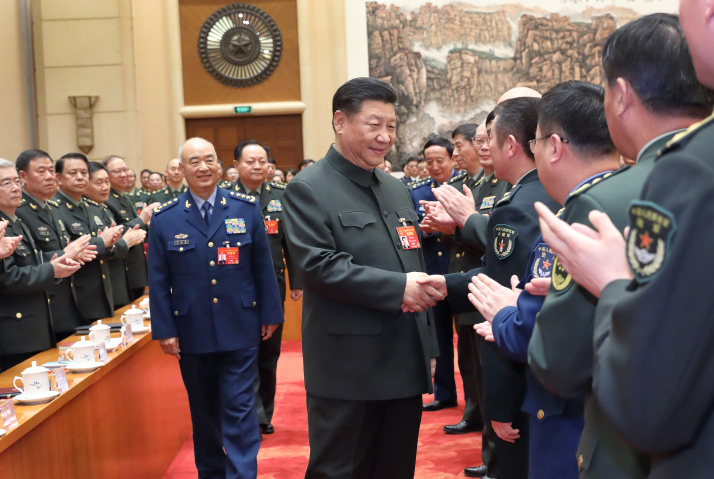 As Chairman of the Central Military Commission, Xi stressed that the set targets and tasks of national defense and military development must be fulfilled as scheduled. He made the remarks during a plenary meeting of the delegation of the People's Liberation Army (PLA) and the People's Armed Police Force on March 12. Xi said the entire armed forces must clearly understand the importance and urgency of implementing the 13th Five-Year Military Development Plan (2016-20), firm up their resolve, intensify their sense of mission, forge ahead with a pioneering spirit and make every effort to carry out the plan in time. After the 18th CPC National Congress, the CPC set the goal of winning modern informationized warfare, putting forward new thoughts and theories for national defense and military construction. Since 2015, it has also carried out bold and resolute reform based on the most fundamental goal of building combat capability able to win. According to the plan, China will achieve the second goal of the three strategic goals for national defense and military modernization construction, namely, completing military reform and having armed forces capable of informationized warfare by 2020. The PLA will also have finished the mechanization of all forces and made important progress in incorporating information and computer technology. The plan also states that the five years from 2016 to 2020 will lay a solid foundation for the PLA to become a world-class military force. China will complete the basic modernization of national defense and the armed forces by 2035, which is the third of the three strategic goals for national defense and military modernization construction. In 2014, Xi proposed the idea of cultural confidence. This concept, together with confidence in the socialist path, theory and system, constitutes the Four Matters of Confidence. In 2017, while delivering a report at the 19th National Congress of the CPC, Xi said that building stronger cultural confidence and helping socialist culture to flourish is an important task. The 18th CPC National Congress put forward the Five-Sphere Integrated Plan to promote coordinated economic, political, cultural, social and ecological advancement, while the Fifth Plenary Session of the 18th CPC Central Committee in October 2015 developed the vision of innovative, coordinated, green, open and inclusive development. The CPC has set the goal of lifting all impoverished people in rural areas out of poverty by 2020, which was first raised by Xi in November 2015. Xi proposed the rural vitalization strategy in the report to the 19th CPC National Congress, stating that issues relating to agriculture, rural areas and rural people are fundamental since they directly concern China's stability and people's well-being. Addressing these issues should have a central place on the work agenda of the Party. After the 18th CPC National Congress, the Chinese Government launched a campaign of mass innovation and entrepreneurship, vowing to change "Made in China" to "Created in China." The report to the 19th CPC National Congress called for making China a country of innovators. In May 2016, the Central Military Commission issued the 13th Five-Year Military Development Plan (2016-20), which is an overall strategy for military development under new circumstances.